Maputo (formerly Lourenco Marques), is situated on Delagoa Bay at the southern extremity of the country. 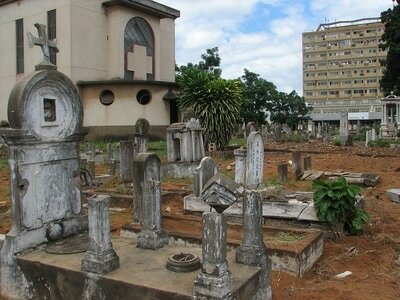 The Cemetery, which is known locally as Cemitero de Sao Francisco Xavier, is located in the north west of Maputo. The Cemetery entrance is on the road known as Avenida Karl Marx, approximately 70 metres from its junction with the central main road, Avenida Eduardo Mondlane. From the hotel entrance go left (south) along Avenida Julius Nyerere. On the opposite side of the avenue, the 5th road along is the Avenida Eduardo Mondlane. From this junction the Avenida Karl Marx is approximately 1 kilometre. Turn right and the Cemetery entrance will be seen on the left side of the road. The two Commission graves are located immediately behind the central chapel building. The special memorial to Able Seaman Bott is approximately 60 metres beyond the chapel and 5 metres to the left of centre of the chapel. The grave of Captain Woodhouse is approximately 80 metres beyond the chapel and 3 metres to the right of centre of the chapel. 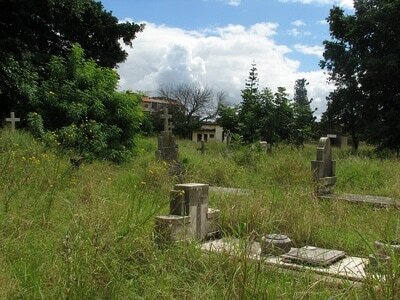 Maputo Cemetery is open every day between 06:00 and 18:00. D/JX 555308 Able Seaman William Arthur Kenneth Bott, H.M.S. President III (S.S. Samaustral), Royal Navy, died 19th October 1945, aged 20. Son of William Arthur and Lilian Bott, of Aston End, Hertfordshire, England. Captain Coventry William Woodhouse M. C., Special List, attd. East African Forces, died 1st November 1918, aged 34. Son of Mrs. Mary C. P. Woodhouse, of 47, Upper Rock Gardens, Brighton.